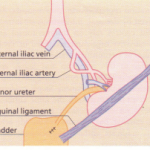 1 A tube is placed into the peritoneal cavity through the anterior abdominal wall. 2 Dialysate is run into the peritoneal cavity, usually under gravity. 3 Urea, creatinine, phosphate, and other uraemic toxins pass into the dialysate down their concentration gradients. 4 Water (with solutes) is attracted into the peritoneal cavity by osmosis, depending on the osmolarity of the dialysate. This is determined by the dextrose content of the dialysate . 5 The fluid is changed regularly to repeat the process. For acute peritoneal dialysis a stiff catheter is inserted under local anaesthetic in the midline, one-third of the way down between the umbilicus and the symphysis pubis. Chronic peritoneal dialysis requires insertion of a soft catheter, with its tip in the pelvis, exiting the peritoneal cavity in the midline and lying in a skin tunnel with an exit site in the lateral abdominal wall. This form of dialysis can be adapted in several ways. Range of concentrations (mmol litre:”) in routinely available CAPO dialysate. Dialysate is present within the peritoneal cavity continuously, apart from when dialysate is being exchanged. 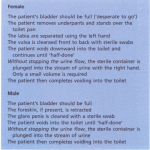 Dialysate exchanges are performed three to five times a day, using a sterile no-touch technique to connect 1.5-3 litre bags of dialysate to the peritoneal catheter; each exchange takes 20-40 min. This is the technique most often used for maintenance dialysis in patients with endstage renal failure. Dialysate is exchanged every 60-120 min, requiring the patient to remain in bed during the treatment. This form of treatment is often used for acute renal failure and as maintenance treatment for end-stage renal failure when 20-40 hours’ treatment per week is given as two or more overnight sessions. (N I P D). An automated device is used to performexchanges each night while the patient is asleep. Sometimes dialysate is left in the peritoneal cavity during the day in addition, to increase the time for which biochemical exchange is occurring. TIDAL DIALYSIS. A residual volume is left within the peritoneal cavity with continuous cycling of smaller volumes in and out. FLUID BALANCE CONTROL. Ultrafiltration, i.e. 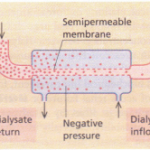 removal of excess plasma water and solutes, is achieved using hypertonic dialysate, which exerts an osmotic ‘drag’. Depending on the patient’s fluid intake and residual urine output, it may be necessary to use one or more hypertonic dialysate bags daily to achieve fluid balance in CAPD. 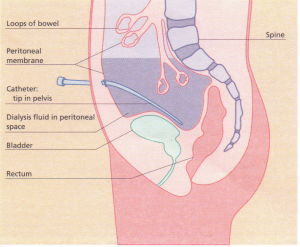 Fluid overload is a relatively common problem in CAPD, and is due to failure of transport across the peritoneal membrane. PERITONITIS. Bacterial peritonitis is the commonest serious complication of CAP D and other forms of peritoneal dialysis. Clinical presentations include abdominal pain of varying severity (guarding and rebound tenderness are unusual), and a cloudy peritoneal effluentwithout which the diagnosis cannot be made. Microscopy reveals a neutrophil count of >100 cells/rnl. Nausea, vomiting, fever and paralytic ileus may be seen if peritonitis is severe. CAPD peritonitis must be investigated with culture of peritoneal effluent. Empirical antibiotic treatment must be started immediately, with a spectrum which covers both Gram-negative and Gram-positive organisms, e.g. third generation cephalosporin intravenously. Antibiotics may be given by the oral, intravenous or intraperitoneal route; most centres rely on intraperitoneal antibiotics. Common causative organisms are listed. Staph. aureus peritonitis should lead to a search for nasal carriage of this organism and Staph. epidermidis peritonitis usually indicates contamination from the patient’s (or helper’s) skin. Relapsing Staph. epidermidis peritonitis with an organism with the same antibiotic sensitivity pattern on each occasion may indicate that the Tenckhoff catheter has become colonized: often this is difficult to eradicate without replacement of the tube under antibiotic cover. Gram-negative peritonitis may complicate septicaemia from urinary or bowel infection. A mixed growth of Gram-negative and anaerobic organisms strongly suggests bowel perforation, and is an indication for formallaparotomy. Fungal peritonitis often follows antibacterial treatment but may occur de novo. Clinical presentation is very variable. It is rare to be able to cure fungal peritonitis without catheter removal as well as antifungal treatment. Intraperitoneal amphotericin has been associated with the formation of peritoneal adhesions. INFECTION AROUND THE SITE where the catheter exits through the skin is relatively common. It should be treated aggressively (with systemic and/or local antibiotics) to prevent spread of the infection into the subcutaneous tunnel and the peritoneum; the commonest causative organisms are staphylococci. Other complications CAPD is often associated with constipation, which in turn may impair flow of dialysate in and out of the pelvis. Occasionally dialysate may leak through a diaphragmatic defect into the thoracic cavity, causing a massive pleural ‘effusion’. The glucose content of the effusion is usually diagnostic or the diagnosis may be made by instillation of methylene blue with dialysate and the demonstration of a blue colour on pleural tap. Dialysate may also leak into the scrotum down a patent processus vaginalis. Failure of peritoneal membrane function is a predictable complication of long-term CAPD, resulting in worsening biochemical exchange and decreased ultrafiltration with hypertonic dialysate. It is thought that this problem may be accelerated by excessive reliance onhypertonic dialysate to remove fluid. Sclerosing peritonitis is a rare but potentially fatal complication of CAPD. The causes are often unknown, but recurrent peritonitis, contamination of the peritoneal cavity with chlorhexidine, and some drugs have been implicated. Progressive thickening of the peritoneal membrane occurs in association with adhesions and strictures, turning the small bowel into a mass of matted loops and causing repeated episodes of small bowel obstruction. There is no known way of reversing the process. CAPD should be abandoned. 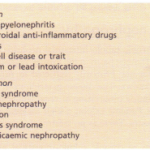 Some causes of CAPD peritonitis. 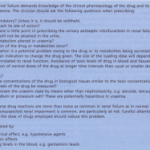 Contraindications to peritoneal dialysis There are few absolute contraindications apart from unwillingness or inability on the patient’s part to learn the technique. Previous peritonitis causing peritoneal adhesions may make peritoneal dialysis impossible: but the extent of adhesions is difficult to predict, and it may be worth an attempted surgical placement of a dialysis catheter. The presence of a stoma (colostomy, ileostomy, ileal urinary conduit) makes successful placement of a dialysis catheter extremely unlikely. Active intra-abdominal sepsis, for instance due to diverticular abscesses, is an absolute contraindication to peritoneal dialysis although diverticular disease per se is not. Abdominal hernias may often expand during CAPD as a result of increased intra-abdominal pressure, and should ideally be repaired before or at the time of CAPD catheter insertion. Visual impairment may make it difficult for a patient to perform dialysate exchanges, but completely blind patients can be trained in the technique if adequately motivated. Severe arthritis makes it difficult to perform the exchanges, but a large number of mechanical aids are available. Sterilization of connections by heat or ultraviolet light reduces the risk of peritonitis. Adequacy of peritoneal dialysis No consensus yet exists on how the adequacy of peritoneal dialysis should be measured. Symptoms of underdialysis (see p. 486) should be noted. A protein intake of at least 1.1 g kg-i ideal body weight together with dialysis adequate to keep peak or average blood urea concentration below 25 mrnol litre'” probably indicates adequate dialysis. Renal function declines less rapidly in CAPD patients than in those receiving intermittent haemodialysis, but with total renal failure it is often difficult to maintain adequacy of dialysis with CAPD alone, necessitating conversion to haemodialysis. CAPD is an excellent treatment or those patients likely to receive a renal transplant or for elderly patients with limited life expectancy, but is probably not the treatment of choice in the small minority in whom long-term dialysis is contemplated.